Flash-mob: Help catalog Eisenhower’s Library! Thanks to LibraryThing member kcgordon, we have a list of the books at the Eisenhower National Historic Site in Gettysburg, PA, so we thought it would be fun to do a quick flash-mob of these (there aren’t a huge number of books, so this probably won’t take too long). We’ve kicked things off already (see Eisenhower’s profile page) but there are quite a few books still to be added, and we’d love to have your help! See the Talk thread or jump right to the project wiki page to get started and claim your section of the library list. No worries if you haven’t worked on a Legacy Libraries project before – this is definitely a good introduction to them! I’ll be helping out too, and will answer any questions you have on the Talk thread. 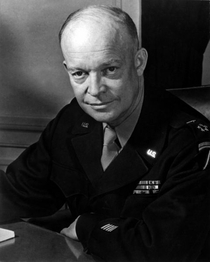 NB: Another LTer is working on obtaining a list of additional Eisenhower books from his home in Kansas, so with any luck at all we’ll be able to add those soon as well. We’ll keep you posted!